My first thought isn’t about the motives of the hackers, or for my own personal data stored in their network. It isn’t even about how long I’ll have to wait before the network is restored. My first thought is for the state of gaming as a whole, and how dangerously close to collapse the whole industry is. For years now, gaming has been on the decline, especially console gaming. Now I’ll be the first to admit that PC gaming has it’s benefits, especially in the current situation, but there are plenty of detractors for the casual gamer. Personally, I’ve always felt that dedicated gaming consoles have created an environment in which developers are all given roughly the same tools and produced drastically different results, often times displaying impressive inventiveness and creativity with those tools. Each generation of gaming consoles have added tools to the kit, even when we haven’t necessarily exhausted the possibilities of the last. It has been a pretty regular (and profitable) cycle for years now, and I think that if it continues, we will start seeing games included in the pantheon of respected arts, such as books, films, and music. However, I doubt it will continue for much longer, looking at the state of this current generation. Lately, console gaming has been falling apart under the myriad pressures of high game costs, higher production costs, regular network hacks, pay-to-win mechanics, Gamestop’s continual shilling of developers and consumers alike, and worst of all, lackluster or half-finished products pushed to market prematurely. It seems that two generations ago, it was regular for a game to take 30-60 hours to complete fully. Final Fantasy games and other RPGs were 100+ hours long. On the last gen, it was pretty common to finish a game on the hardest difficulty in about 16 hours without much hassle. On this incarnation, you can beat a game like Assassin’s Creed Unity in about 8-12 hours, especially if you feel like tossing a few more dollars down. Furthermore, it feels like the games themselves have fewer and fewer activities and are becoming simpler all the time. For example, anyone who has played Saint’s Row 2 and 3 agrees that 2 had far more side missions and took much longer to complete than it’s sequel. They also deemed it necessary to remove the atypical mission progression from 2, opting for a simpler and more straightforward style for 3. The same could be said for Fable 2 and 3; 3 took much less time to finish, and utilized a simplistic leveling system instead of the color-coded multiple experience point set-up from 2. From leading us by the nose to making decisions for us, games are getting dumber across the board. So why is this happening? In a word, money. With the sheer numbers of games on the market each month, consumers simply dont have the time to flesh out all the nuances of gameplay with each title they pick up, so developers have stopped wasting their time and money on features that only 10% of the target market are ever experiencing. Statistics show that more than half the people who pick up a new game will ever see the end credits before moving onto another new release. Some titles cost more than a million dollars, and in the end it becomes little more than math; its just not feasible to create so much content that no one will touch without charging upwards of 60$ per game, or loads of DLC that should have been included in the original game, or addin in-game purchases, or rushing a game out the door to make the sales figures in order to finish it. All of these things are signs of an industry floundering and bleeding money, and when something like a targeted hack shuts down the network on the day that hundreds and thousands of people should be meeting their console for the first time, it just gives me bad feelings for the future. The only way that games can protect themselves from attacks like this is more security, especially for online games, and that means more money, which will probably come out of the consumer’s pocket once again. Or worse yet, with quality of games declining and networks eternally open to attack, consumers and developers alike will probably just cut their losses and play a board game, watch a movie, or read a book. Triworlds Revolution: Homeworld Blues is available on Kindle, iBooks, Kobo, Nook and Smashwords! New Book Announcement! Triworlds Revolution: Homeworld Blues is available for sale! Hey everyone! 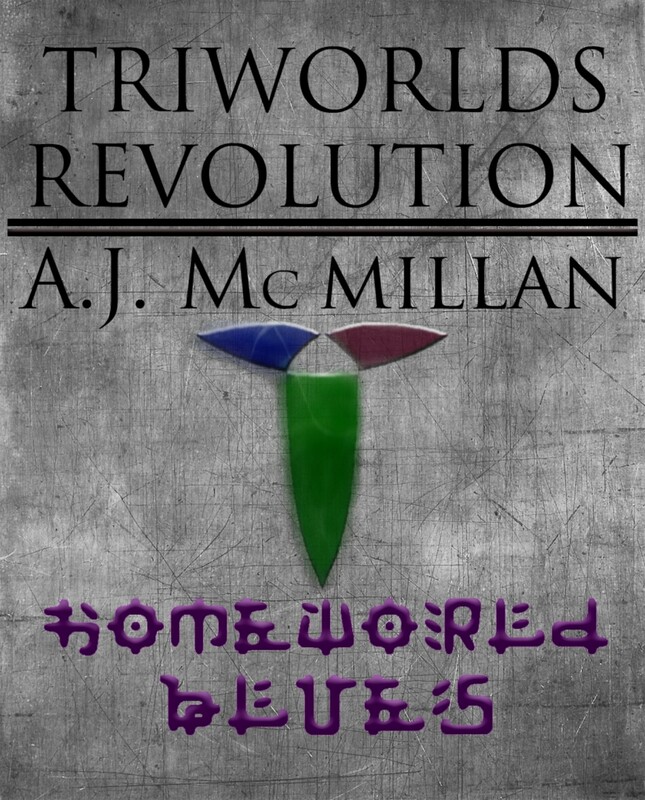 I know its been a while, but I’ve been hard at work preparing and planning the launch of my first published novel, Triworlds Revolution: Homeworld Blues! I’m proud to announce that it has been approved for the Smashwords Premium catalogue, so now it is available on all major ebook retailers, including Barnes and Noble Nook, iBooks, and Kobo, in addition to the Smashwords Bookstore and the Kindle Store! Follow the links here to check it out and download a free sample! And just in case you were wondering what the book is about, here’s a synopsis! As a member of the ruling class aboard a star ship destined to carry her people to a new home world, Trayia is duty-bound and loyal to the cause. But when an encounter with the rebellious Kavata opens her eyes to the ship’s dark secret, she begins to question everything she has ever known. As the black and white world around them falls away, the young women embark on an epic journey to find the key to their people’s survival and learn the truth behind their origins; with the help of a blind monk, a fugitive prisoner, and a clueless drummer. Triworlds Revolution: Homeworld Blues opens the door on an epic trilogy that crosses worlds and genres, weaving an exciting and suspenseful tale filled with memorable characters and enthralling locales while it explores what it means to be truly free through the lens of a broad sci-fi fantasy world. So check it out! I hope everyone has as much fun reading it as I did writing it, and if you enjoy it, please review and share as much as you can! And look forward to Triworlds Revolution Book 2 coming in 2015! I realize I haven’t made a post in a while, mostly because my life has been really hectic lately. This blog is supposed to be a place for my random thoughts and musings, as well as a chronicle of my success and a venue for sharing my short stories. However, current events have derailed my latest short story idea, causing me to put it on the back burner for a while. Also, my personal thoughts have been very mundane lately, dealing with common day to day issues, and nothing that would be worth posting. Today, however, I decided to ramble about a passion that I have, and since it is currently WAY too hot in my part of the world, my thoughts are on a specifically refreshing beverage, and I thought I’d share that with you all. Root beer. I absolutely love root beer. Is there a more delicious, crisply sharp and wondrous drink? The carbonation, the sweetness, the hint of licorice and anise, the foam that rises to greet me every time I fill my glass… I can’t live without it. Cola is nice, and coffee most certainly has its place, but root beer reigns king among refreshment in my mind. There are as many types of root beer as there are shades of crayola. Every one has its merits, and each should be sampled, but as of yet, there is one flavor of root beer that rises above all others, with good reason. Micro-brewed sodas are all well and good, but to my knowledge there is only one root beer that incorporates sweet caffeine into its recipe. Barq’s root beer claims to have bite; I don’t know if that’s true, but if by ‘bite’ they mean ‘necter of the waking’, I’m inclined to agree. All root beer is delicious, but the extra dark, extra crisp caffeinated mead that coca-cola has filled their bottles with is my absolute favorite drink. One would think that with all of the root beer I drink, I would grow bored of it, eventually yearning for a different, perhaps more sophisticated refreshment. However, one of the best things about my sworn soda is that it has the magical ability to take another icy cold gift from the gods- Ice cream- and increase its wonder tenfold. Vanilla Ice cream and crisp root beer… I defy the universe to deliver a more amazing libation to be consumed for the pleasure of my taste buds. Anyway, with the impending heat wave, I suggest that anyone in a warm climate acquire a fresh Root Beer Float at the earliest convenience. Here goes nothing! My name is A. J. McMillan, and what I plan to do here is chart my course through the world of science-fiction writing. I will chronicle every step of my journey here, as well as keep people informed of my personal opinions of things that the world does that are “not ok.” That covers everything from crocs to politics, both of which are “not ok” in my eyes. I’ll also talk about pop culture, current events, video games, music, movies, books, comics, action figures, asteroids, tree houses, starships, time machines, black holes, food, and the progress of the human race toward a technological ‘singularity’ that will move us forward on our ultimate evolutionary path of destiny. Maybe. Ideally, this will be a place for my frequent “word diarrhea” can work itself out passively, without damaging the social connections I have with the people around me. It seems that lots of folks get tired of listening to a constant babble of societal commentary. Go figure. I also want to post comics relevant to the topic du jour, hopefully regularly enough to be relevant. As I move forward on my path to Sci-Fi/Fantasy authoring, I plan to post my progress and pitfalls here. Just like many others who have helped me get where I am, I want to assist other fledgling authors come closer to their goals. And let me tell you, it is a tough process that takes dedication and determination. We all need all the help we can get. It will be also interesting to reflect back on these older posts one day from my career as a professional waiter, recalling the naive days when I held out hope for my future. Well, at the risk of going long winded on a first post, I guess that’s about it for now. In the next post, I’ll probably further outline the project I’m currently working on shopping around to agents, of course, without any spoilers.